Realistic painting reached its golden age with the 17th century “Dutch Masters,” painters whose mastery of detail and recreation of faces and light were unmatched until the advent of photography hundreds of years later. But what if they had help? What if the technology of the day gave them shortcuts to perfectly rendering colors, scale and detail onto canvas? Tim Jenison, a rich inventor of video gadgets and lifelong self-taught tinkerer, read a book by modern artist David Hockney, “Secret Knowledge,” which suggested they “cheated.” Jenison went to the trouble of testing Hockney’s theory, back-engineering 17th century-style technology to do it. 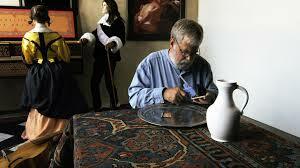 He figured out a way to paint his own Vermeer. And since Jenison is pals with the media savvy illusionists Penn & Teller, his effort is documented for “Tim’s Vemeer,” a fascinating documentary experiment in fathoming the heretofor “unfathomable” genius of Johannes Vermeer. Jenison was struck by the technical “accuracy” of the paintings of the man who left posterity “Girl with a Pearl Earring”, “The Music Lesson”, “The Astonomer” — some 35 masterpieces, despite being relatively unheralded in his own lifetime. Jenison, working from Hockney’s suggestion, delved into the Delft master’s access to mirrors, lenses and that new image reflecting device of Vermeer’s age — the camera obscura. He came up with a way Vermeer might have painted. And despite having no art training at all, Jenison resolved to replicate Vermeer’s “The Music Lesson” by recreating the room where Vermeer did most of his painting, from the light conditions (northern exposure) down to the furniture, ornate Persian rug, the clothing, filigreed musical instruments and models used in that painting. “Tim’s Vermeer” captures every step of the process — visiting The Netherlands, ducking into London’s Buckingham Palace to see the original “Music Lesson”, Tim’s failed experiments and refinements, his demonstrations to Hockey and others who believe, as he does, that gadgets were used to “cheat” and paint so accurately. It’s a fascinating look deep into the work of a great artist, a story told with flashes of humor and more than a little tedium. Jenison makes a reasonably compelling (mildly eccentric) character to build a movie around. And the film is a wonderfully convincing counter-history. Even though, as Tim points out on several occasions, “There’s no documentation that he did this,” “Tim’s Vermeer” wins its own argument with the evidence presented by the pictures and the fact that this detail-oriented tinkerer could mimic the master stroke for stroke. But here’s the rub. The movie lacks that thing that Penn & Teller have built their latter careers on — skepticism. For guys who rolled their eyes at global warming on TV back in 2004 (only to walk that back, or pretend it never happened), they seem reluctant to track down an artist or art historian who asks some fairly obvious questions that might puncture Tim’s experiment and Hockney and “Vermeer’s Camera” author Philip Steadman’s theories. How practical is this? Granted, it would have taken a trained painter somewhat less time to create a painting this way than the hundreds of days it takes Jenison. But seriously, who could make a living with his brush spending months staring at the same image, tracing/matching it by mirror? Would models have agreed to devote so much time to this? These weren’t famous personages, so who would foot the bill for that obsession? And are the optical clues so convincingly presented by Jenison and seconded by Hockney unexplainable by any other means? “Tim’s Vermeer” doesn’t settle the argument, but it feeds that theory that “unfathomable genius” sometimes can be fathomed. And it entertainingly makes the case that this mirror method could be used to create photo-real images of people, places and things, for anyone who has a year or so to try it. Credits: Directed by Teller, written by Penn Gillette and Teller. A Sony Classics release.